Have you been to the pet store lately? If so you probably noticed that dog toys aren’t cheap. 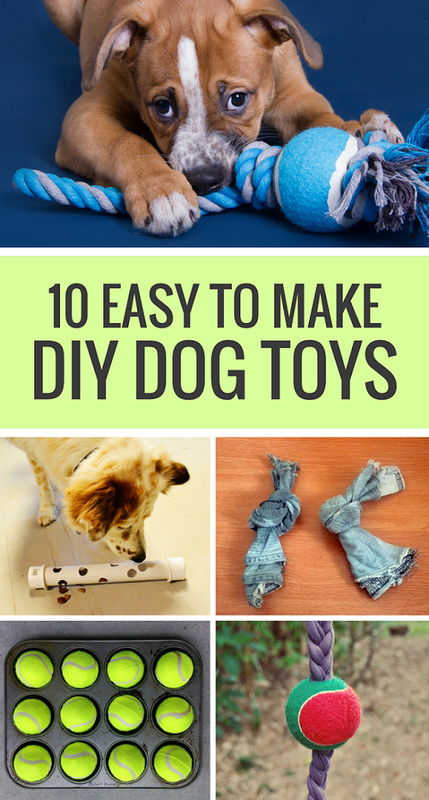 Luckily there are lots of simple DIY dog toys you can make at home. Confession time: I’m not a crafty person, no matter how much I wish I were. I’ve created so many Pinterest fails I could put you to shame. “Easy weekend project?” Yeah, right. Most dogs love to chase, which is why flirt poles are a great choice — especially for high drive dogs. A quick 5 minute game with a flirt pole will provide your dog with plenty of physical exercise. If you have some PVC pipe lying around use that as the rod. If not you can be like me and make a one with a long stick you find in the yard. You’re also going to need some bungee cord or rope, sold at hardwood stores. 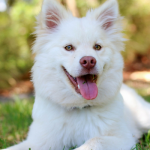 You could use rope but be very careful – you don’t want to jerk your dogs neck when they catch the toy. The ‘prey’ can be anything from a stuffed toy to an empty water bottle, as long as you can tie it to the rope you should be fine. Thread your bungee or rope material through the PVC or if you’re cheap like me tie it to the end of the stick. You want the rod to be a decent distance away from you, 3-5 feet should be fine. If you’re using the PVC knot it at one end so it won’t come lose when it’s being flailed about. The only thing that’s left is tying the ‘prey’ to the other end of the line. Now you’ve got a fun DIY toy to play with. Caution – don’t play this game with growing puppies, it’s very tough on the joints. Check out The Darling Dog’s great video on making a DIY flirt pole. If you’re looking for something smaller than a traditional flirt pole check out this $2 option. 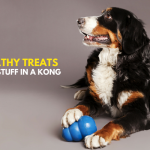 Dogs just love crunchy stuff — and plastic bottles make some pretty satisfying crunches. If your dog is a tough chewer remember to to supervise them well with this toy. To make your own DIY plastic bottle toy just take a plastic bottle and wrap it in a sock or fabric of your choosing. Check out this great DIY Plastic Bottle Toy from Ammo the Dachshund. I love playing tug with my dog. Minute for minute it’s one of the most physically & mentally exhausting games there is. And the good news is if you don’t have a tug toy at home you can easily make your own with a piece of rope and tennis ball. 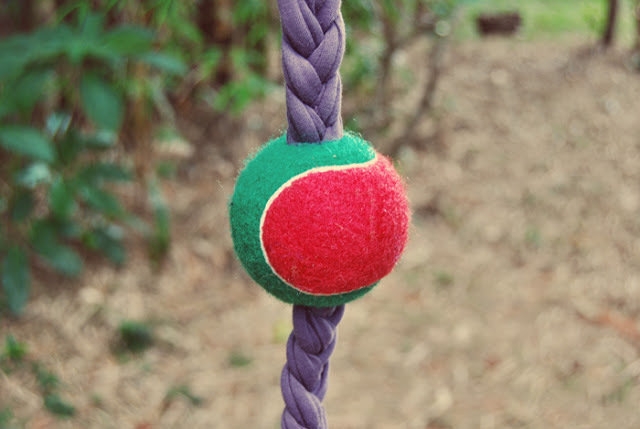 For this easy to make DIY dog toy you’ll need a piece of rope and a tennis ball. 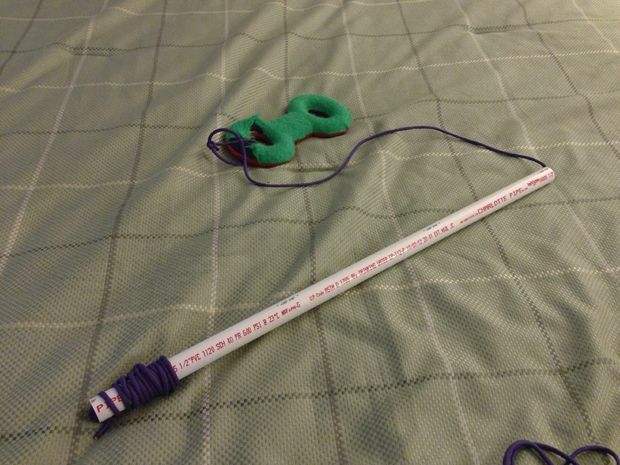 To make the toy just cut or drill a hole on each side of the ball; just large enough to thread the rope through. Fit the ball onto the center of the rope, tie some knots to keep it in place. If you want to make it into a great tug toy tie some knots at the end as well. 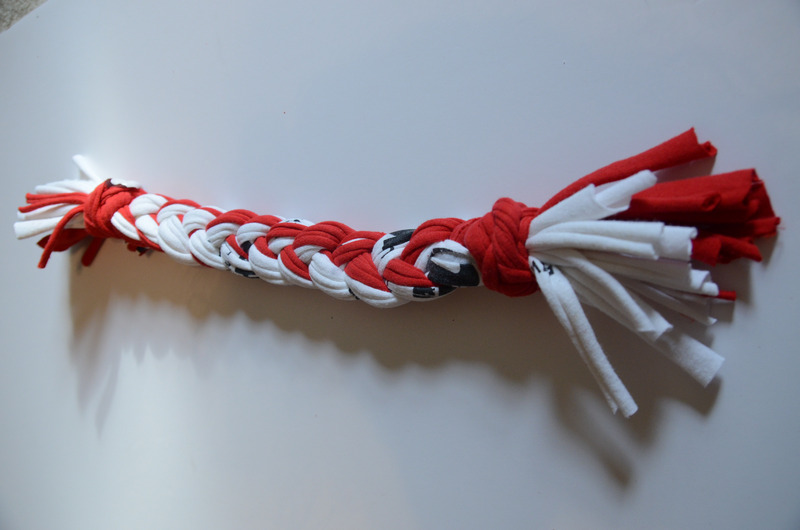 If your dog is a tough chewer you can use old braided fabric for the rope to toughen it up a little. Does your dog like puzzles? Looking for a really simple way to entertain your dog? 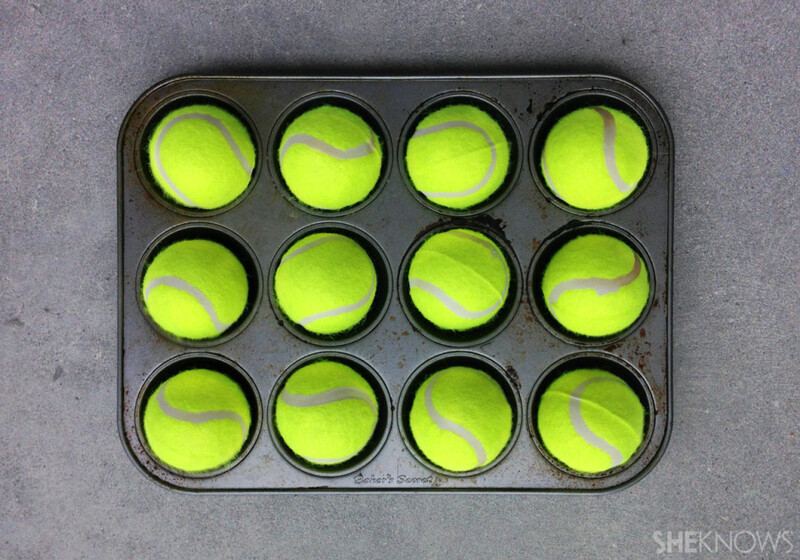 Make him a simple tennis ball muffin tin puzzle. Place some treats in the muffin tin and hide them by placing the tennis balls over them. This toy is great for playing fetch or tug and it’s really simple to make. You’ll just need a couple of t-shirts and a pair of scissors. You can check out the full instructions on BarkPost. Looking for a super simple DIY dog food puzzle? 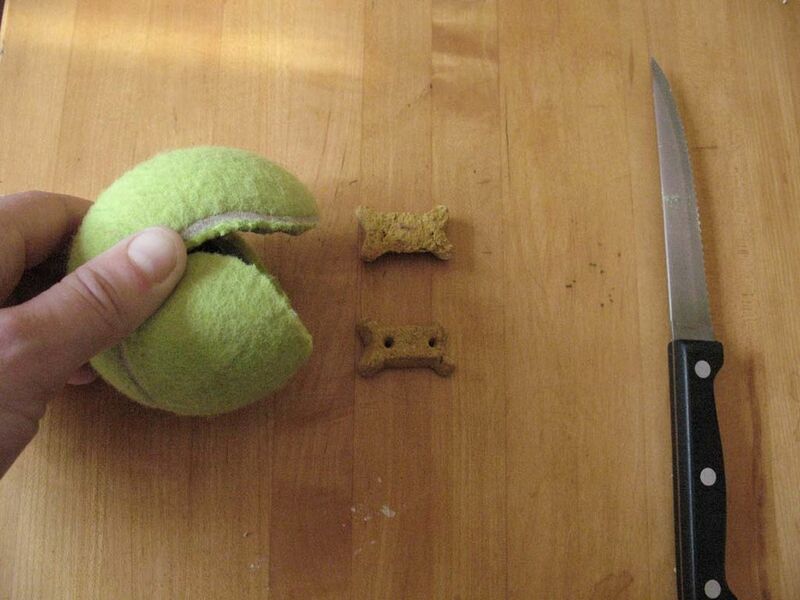 Just cut open a tennis ball and fill it with treats and you’re good to go. 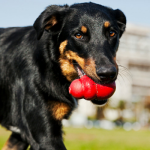 Does your dog destroy most toys within minutes? If so you’re not alone. 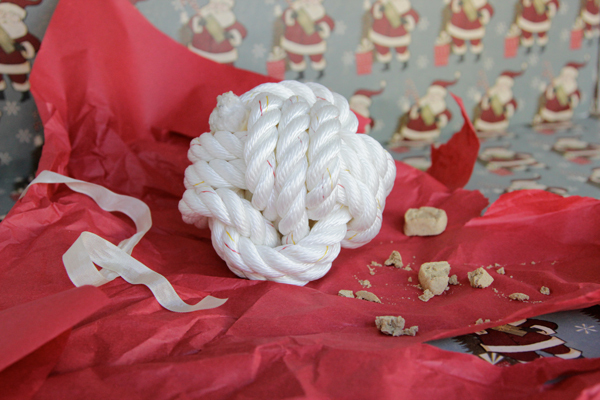 If your dog is a tough chewer check out this easy to make rope ball. Just remember to supervise your dog with this toy — if they start to tear up the rope itself it poses a potential choking hazard. Food toys are a great way to keep your dogs mind occupied, and it adds a lot of mental stimulation to dinner time. 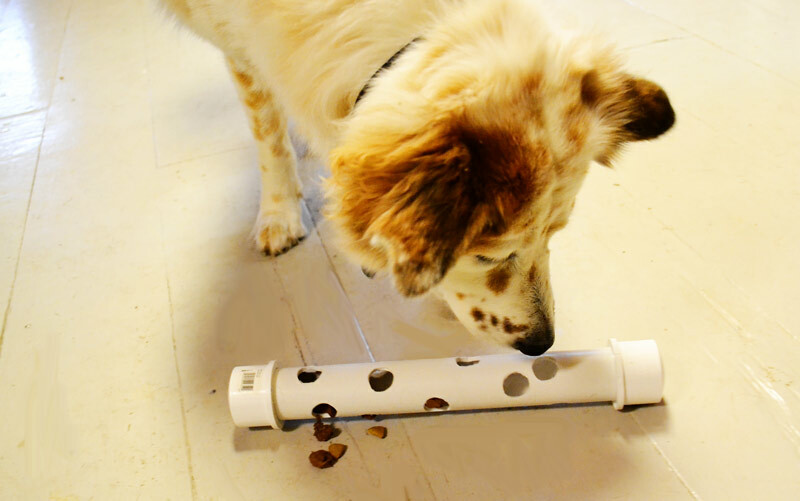 Want to make your own interactive dog food toy? Check out the full tutorial on Dog Tipper. Got some old jeans lying around? Instead of making another pair of cutoffs make your dog a simple no-sew denim toy. Who needs more cutoffs? 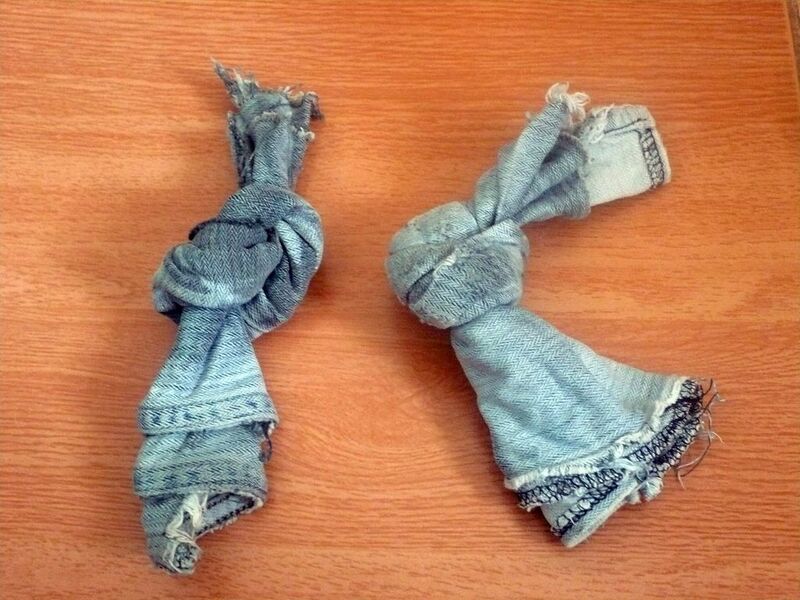 Take an old pair jeans and make your dog their own denim dog toy. Most dogs love a good game of tug, and contrary to old myth it will not make your dog aggressive. Just be sure to set a few rules and boundaries such as “the game stops if I feel teeth on my hands” before you begin. 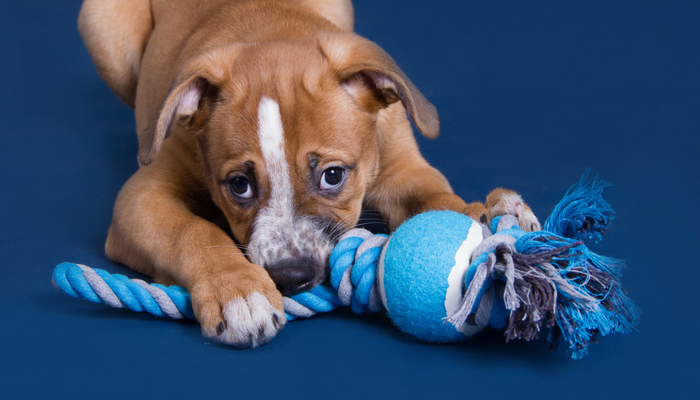 Does your dog like to play tug? 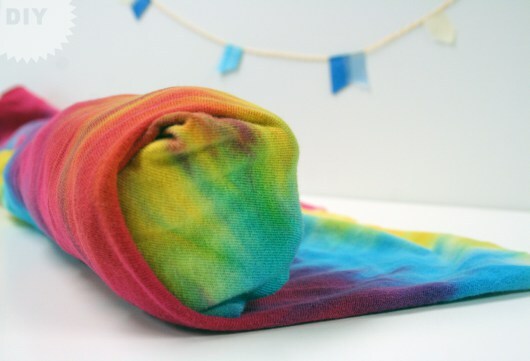 Make them a simple DIY tug toy from old t-shirts. 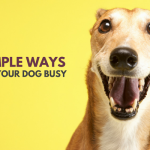 Looking For Some More Ways to Keep Your Dog Busy? Looking for more ways to keep your dog busy & entertained? Be sure to check out the following articles. Love this article, my puppy personally favors the sock toy. Thank you! Totally agree, and as we all know dog toys don’t tend to have a long shelf life anyway lol. That flirt pole is so cool! I have never seen that before but will definitely try! Reminds me of some of the cat toys we have. All of your ideas are brilliant but the muffin tin puzzle game, that’s awesome and SO easy to create! Awesome! As a Mom of three canine kids, finding ways to entertain them (without breaking the bank) is always welcome! Our middle boy, a Tibetan Spaniel, loves the muffin tin puzzle (although it only took him a few minutes to figure the thing out). Will have to check out some of these other ideas! I love the muffin tin game, and it’s a really nice way to “test the waters” before buying any food puzzles since they can be pretty expensive. Luckily my dog loves them, but I’ve seen dogs flat out ignore them. Fantastic! Haley would probably love all of these, but especially the interactive feeder toy! It’s awesome to make toys and puzzles from items you might normally throw away too. Thanks so much for all these great ideas, Jen! 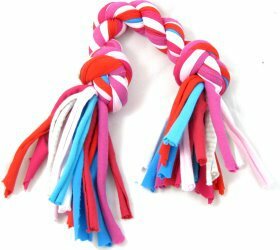 I love the idea of making my own dog toys and there’s some great ideas here, but unfortunately my Staffie would destroy these in less than 30 seconds! Yeah unfortunately my dog Laika has a tendency to destroy things if I leave them out as well. What I like about a lot of these (the muffin tin game, flirt pole, tug toys) is that they’re interactive. So once we’re done playing with them I can put them away until the next time we play. If I’m looking for a super tough dog toy that I can leave out for my dog then I’ll stick with Benebones, West Paw toys or certain Kong items. My 11 week old puppy loves number 5 she didn’t put it down for an hour after I gave it to her. It is hands down her favorite and she’s got a lot for the amount of time we’ve had her. That’s awesome, and I was really surprised at how easy that toy was for me to make considering I’m not crafty at all. Glad to know she’s getting a lot of use out of it.